Last Monday the news came down that the workoholic known as Robert Downey Jr. would be taking on a new role as the voice of Peabody in an adaptation of the Rocky and Bullwinkle short Mr. Peabody and Sherman. 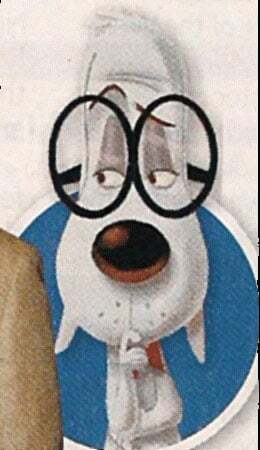 Part of the report was that the next issue of Entertainment Weekly would have the first look at the brilliant, glasses-wearing, time-traveling canine, and now that images has found its way online. Cartoon Brew has gotten their hands on a scan of the character, although they are calling it "concept art" and aren't saying whether or not it is from EW. Basically a 3D CGI version of the character that we all know and love, there really isn't anything to complain about. Hell, they even let him keep his spiffy red bowtie. Check out the image below and if you need help envisioning just what Robert Downey Jr.'s voice will sound like for the character, I've also included the new Planters commercial, which features RDJ as Mr. Peanut. Check it out!